After Walters State Community College was authorized by the 1967 General Assembly, Hamblen County was chosen by the Tennessee Higher Education Commission as a location. The Tennessee State Board of Education then chose a campus site located on the southeastern edge of the city of Morristown, two miles from the Hamblen County Courthouse. This main campus includes 134 acres of beautiful rolling land that faces east with access roads from the Appalachian Highway. This highway is the connecting link between Interstate 75 in Kentucky and Interstates 81 and 40 into North Carolina and Virginia. The college also occupies modern education facilities in Greeneville, Sevierville, and Tazewell, Tennessee. In 1957, the Pierce-Albright Report on Higher Education in Tennessee was made to the Tennessee Legislative Council. This report reflected the need for additional higher education opportunities to be provided for the average Tennessean. Upper East Tennessee was one of many places where higher education was not readily available to the citizens. In 1963, the Tennessee General Assembly appropriated $200,000 for use over a two-year period to implement the Pierce-Albright Report. The State Board of Education, under the direction of Commissioner J. Howard Warf, developed plans for the establishment of a group of community colleges to serve these areas without access to higher education. The goal was to have one of these colleges within a 30-40 mile commuting distance of every Tennessean. Admission to these colleges was not to be restrictive to recent high school graduates, but was to be an “open door” opportunity with colleges serving a whole community from ages 18 to 80. Acting upon the recommendations of Governor Frank G. Clement and the State Department of Education, the 1965 Tennessee General Assembly authorized the establishment of the first three of these colleges, one to be located in each of the state’s three Grand Divisions. Columbia, in 1966, became the first operational community college in Tennessee, Cleveland and Jackson opened in 1967. Dyersburg and Tullahoma provided sites for the next two which opened in 1969. Walters State Community College, located in Morristown, was the sixth such college. Its opening date was September, 1970. In 1969, the General Assembly authorized three more community colleges: Roane State in Harriman, Volunteer State in Gallatin, and Shelby State in Memphis. The nine community colleges and the regional universities were under jurisdiction of the State Board of Education. Chapter 838 of the Public Acts of 1972 authorized establishment of the State University and Community College System of Tennessee, today known as the Tennessee Board of Regents system. The elements of the system include the state universities and state community colleges which had been under the State Board of Education, the Board of Regents, and the Chancellor. The new system of governance became effective on July 1, 1972. Chattanooga State Technical Community College, the 10th community college, was added to the community college system in 1973. Since that time, the state’s technical institutes have been upgraded to community college status and the addition of 27 colleges of applied technology has made the Tennessee Board of Regents System the sixth largest system of higher education in the nation. The Tennessee Board of Regents and the Board of Trustees of the University of Tennessee System are coordinated by the Tennessee Higher Education Commission. This sixth community college, Walters State Community College, was named for former U.S. Senator Herbert S. Walters who played a key role in the establishment of a community college in Morristown. In 1970 the campus of Walters State was under construction and temporary quarters were used during the first year of operation. The College Center Building was completed in the fall of 1971. It was renamed the Dr. Jack E. Campbell College Center in 2005. The next major addition to the campus was the Career Technology Building which was completed in the winter quarter of 1975. The Career Technology Building was expanded and renovated in 1987 and the new facility was renamed the Technical Education Building. In 2001, this building was renamed the Clifford H. “Bo” Henry Center for Business and Technology. The Life Sciences Building, completed in December 1979, was essential to provide needed classrooms and faculty offices for a rapidly growing student body. This building, which was renamed the Math and Behavioral/Social Sciences Building, was completely renovated during the 2001-02 academic year. It re-opened to students and faculty in the fall of 2002 and was renamed the Doggett Mathematics and Behavioral/Social Sciences Building in 2004. In the summer of 1979 the construction of the Humanities Complex began. The project was completed in the fall of 1980. The Humanities Complex was renamed the Judge William H. Inman Humanities Complex in 2001. In December of 1979, the college added the Plant Operations Building to the physical facilities inventory to handle the functions of maintenance and repair. 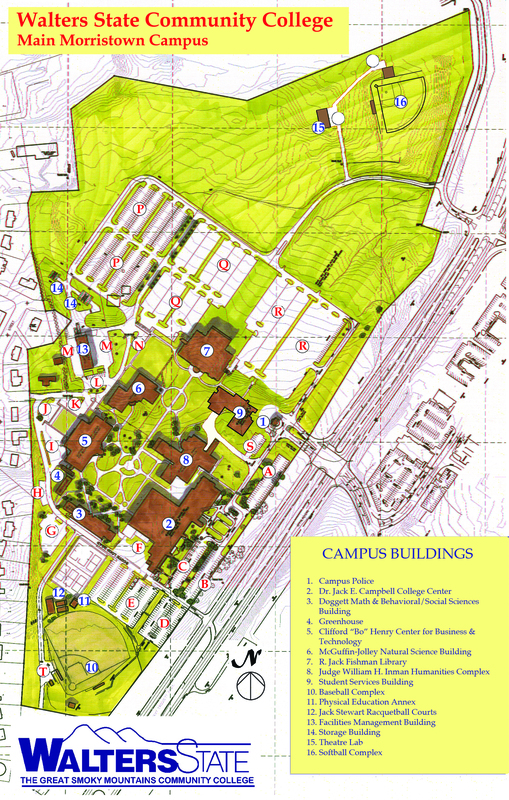 In 1994 the college began construction of the Campus Development Phase II master plan which includes a new Library, Math and Science Buildings, Public Safety Center, and Administration Building. The new Library opened in May 1997 and was named the R. Jack Fishman Library in 2004. The Natural Science Building was occupied in July 1998 and renamed the McGuffin-Jolley Natural Science Building in 2005. The college’s Great Smoky Mountains Expo Center opened in March 1996 and additional support facilities were added during 1998-99 and 2007. Walters State has established three additional campus sites; the Sevier County Campus, the Greeneville/Greene County Campus, and the Claiborne County Campus. In 1999, the first building on the new Sevier County Campus was named Maples-Marshall Hall. Two more buildings on the Sevier County Campus, Cates-Cutshaw Hall and the Conner-Short Center, opened in 2008. In 1995, the Greeneville/Greene County Campus moved into the former Laughlin Hospital building in the heart of downtown Greeneville. The college opened the Claiborne County Campus in 1995. Walters State received accreditation by the Southern Association of Colleges and Schools in 1972 and, after completion of an effective institutional Self Study Program, received reaffirmation of accreditation in December 1976. Extensive institutional Self Studies were completed during 1985-87, 1995-97, and 2005-07. Subsequent to the successful Self Studies, Walters State received reaffirmation of accreditation in December 1987, December 1997, and June 2008. Walters State, as a premier community college, will be committed to increasing educational attainment and workforce preparedness through excellence in teaching and service. An Educationally Purposeful Community, where students, faculty, administrators, and staff share academic goals and work together to strengthen teaching and learning. An Open Community, where freedom of expression is uncompromisingly protected and where civility is powerfully affirmed. A Just Community, where the sacredness of the person is honored and where diversity is aggressively pursued. A Disciplined Community, where individuals accept their obligations to the group and where well-defined governance procedures guide behavior for the common good. A Caring Community, where the wellbeing of each member is sensitively supported and where service to others is encouraged. A Celebrative Community, where the heritage of the institution is remembered and where rituals affirming both tradition and change are widely shared. A Grateful Community, where we are thankful for all of our generous benefactors and supporters. Walters State is a learning-centered, comprehensive, public community college dedicated to increasing educational attainment and supporting economic development by providing affordable, high quality educational opportunities. pursues resourcefulness, effectiveness and efficiency through comprehensive accountability and continuous improvement programs. The Tennessee Board of Regents is the nation’s sixth largest higher education system, governing 46 post-secondary educational institutions. The TBR system includes six universities, 13 two-year colleges and 27 colleges of applied technology, providing programs in 90 of Tennessee’s 95 counties to more than 200,000 students.